In order to function properly, the human body requires specific amounts of vitamins and nutrients. 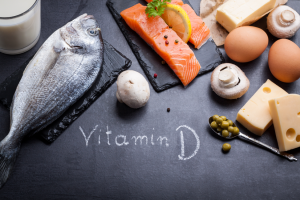 An important, but often under-consumed vitamin is Vitamin D.
Those who don’t consume enough Vitamin D on a regular basis often deal with lethargy, exhaustion, and even depression. However, these aren’t the only repercussions of a Vitamin D deficiency. In fact, there are many, many more. Looking to gain a better understanding of Vitamin D? Would you like to know more about its importance? Then read on! What Function Does Vitamin D Serve? The human body needs Vitamin D for a number of different purposes. This vitamin not only helps the body to function physically, but emotionally and psychologically as well. Physically, it promotes bone growth and heart health, and strengthens the immune system. Psychologically and emotionally, it combats depression, anxiety, and general mental fatigue. It also suppresses appetite, which aids in weight loss. What Happens When You’re Deficient in Vitamin D? Research has shown a connection between Vitamin D deficiency and the occurrence of specific cancers. These cancers include breast cancer, prostate cancer, thyroid cancer, and lung cancer, in particular. This probably has to do with the fact that Vitamin D is an immune system booster. By taking away Vitamin D, you take away the immune system boost that could help prevent cancer. Do you deal with depression? If so, a lack of Vitamin D could very well be the culprit. Depression has been directly linked to the vitamin, with extreme levels of depression often accompanying extreme deficiency, and low levels of depression often accompanying mild deficiency. Vitamin D deficiency has also been linked to heart disease. Those who suffer from deficiencies run a greater risk of suffering stroke, hypertension, and arterial disease. Unfortunately, quite a few American are deficient in Vitamin D. In fact, studies have shown that ¾ of American adults suffer from a deficiency of some level. The reason for this is simple: most Americans don’t consume enough Vitamin D on a regular basis. Wondering what these sources of Vitamin D are? Read on! Though plenty of foods are high in Vitamin D, many Americans fail to consume these foods on a consistent basis. Foods that are rich in vitamin D include cow’s milk, egg yolks, fish, and orange juice, to name just a few. Long ago, Vitamin D deficiencies were few and far between. The reason for this? Most human beings got plenty of sunlight. The sun’s UV rays are a huge source of Vitamin D. Absorbed through the skin, they create cholesterol in the body. Then, this cholesterol is used to create more Vitamin D. In essence, it’s important to try and get out in the sun on a consistent basis. One of the easiest ways to consistently meet your Vitamin D needs is by taking Vitamin D supplements. Most of these supplements need only to be taken once a day. You won’t have to work them into meals, making them quick, efficient, and convenient to consume. Don’t want to worry about getting enough Vitamin D through sun exposure and meals? Interested in utilizing Vitamin D supplements? If so, and if you’re looking for Vitamin D supplements in Chicago, Illinois, the Feely Center for Optimal Health is the place to call. We sell one of the most effective Vitamin D supplements on the market. Called D 5000, it aids in blood sugar regulation, bone growth, immune system regulation, and much, much more. Any questions? Don’t be afraid to contact us!